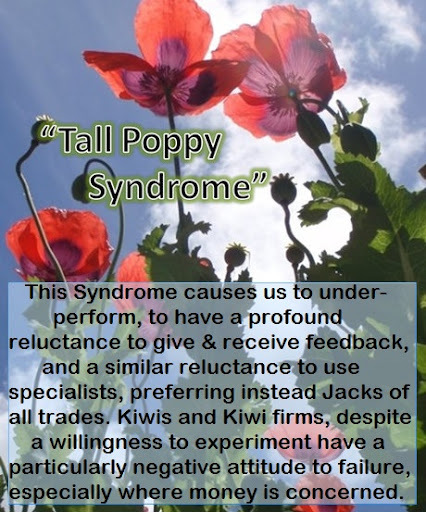 We need to overcome the long standing disadvantages resulting from the ingrained issues of tall poppy syndrome and aspirations of mediocrity found in the Kiwi culture (1). After all, getting people reading social media content you produce is dependant on grabbing their attention (2). Research has inspired five top tips for Kiwis producing social media content which gets read. Us Kiwis apparently have a tendency to work harder, not smarter. Recent reports (3) have found that the entrepreneurial nature common among Kiwi's while innovative, limits our potential, and even negatively impact our work life balance. Not recognising the value of our own uniqueness, it is common place for small businesses to fail to capture the value of their innovations. Despite the rare exceptions, the profits from many Kiwi innovations are rapidly shipped off shore. Now, as digital environments become increasingly integrated within mainstream society (4) the rules of the game have changed. Being at the bottom of the world is no longer of significance and now we have access to markets & opportunities never before seen. Despite strong development in some industries which we have seen in recent years, social media is continuing to influence markets. And small businesses in particular, appear to be behind the eight ball (5). Those whom have recognised the inevitable impacts of these trends have started to talk about Social Media strategies (6). At the essence of these concepts realistically, is the need for dynamic and customized approaches to managing media and interacting with your audience. Considering our culture orientations, we each need to make concious efforts to evaluate and consider our use of such media's. While the first tip, stand out from the crowd, might go against the Kiwi grain, the others are perfectly suited to our culture. If utilised correctly, social media has the potential to start social movements and valuable resources. Provide something no one else is. The essence of Social Networking Sites particularly is to connect, share and explore connections within the community. Its critical you appeal to your audience and provide something new . Regardless of what you want to say or sell, people today want to be entertained. If I can't get something out of it, why would I keep reading? If you want peoples attention, you can be a resource or you can entertain them, but doing both is even better. Readers want to experience your personality through your writing so don't be too stuffy or professional. The reader expects to get an sense of your personality through your writing. Leave out any jargon and avoid using overly complicated language. The nature should remain conversational, imagine you are talking to the reader. Quickly get to the point and leave out the bulk. Write to an inverted pyramid- start with the conclusions first to keep people reading. Keep it relevant and relate-able to your audience.